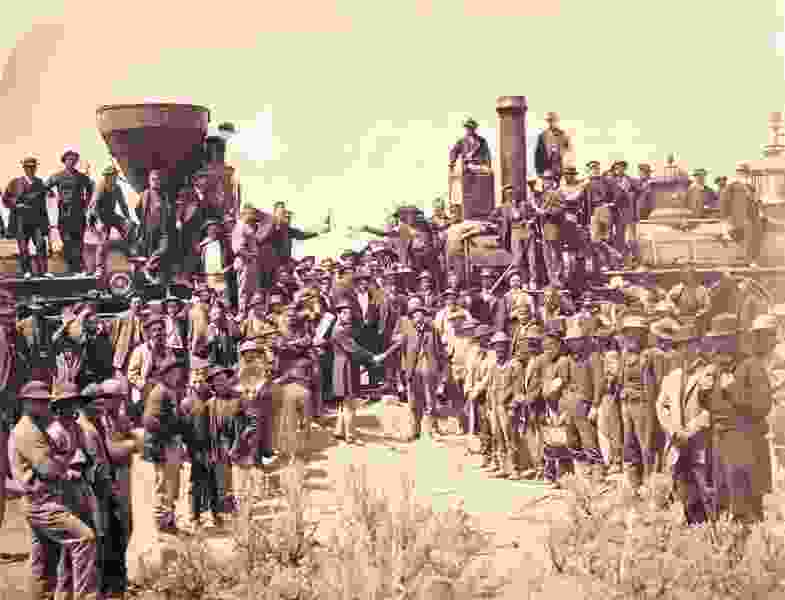 Just weeks before Utah commemorates the historic meeting of the rails 150 years ago, federal and state land managers have leased lands along the first transcontinental railroad route west of the Great Salt Lake for oil and gas drilling at bargain-basement prices — 26 parcels to a single obscure company with no known history in the energy business. The parcels are either on or near the historic Central Pacific rail corridor about 40 miles west of the Golden Spike National Historical Park, recently upgraded under a massive public lands bill signed in March by President Donald Trump. These remote lands remain largely unchanged from the days when Chinese and other laborers laid rails across northwestern Utah in the spring of 1869 before tying them into the Union Pacific track coming from the east on May 10 at Promontory Summit, according to the Bureau of Land Management’s environmental assessment of these leases. “Visitors to the [Central Pacific route] today can essentially experience the area as it was in 1869,” the assessment states. The stretch under lease is considered the most pristine section that remains of this historic rail corridor that began in Sacramento, Calif., climbed over the Sierra Nevada and crossed the Great Basin. Drilling — if it ever actually happened there — would inflict unacceptable damage on the historic fabric of this largely unmolested landscape, according to groups that oppose leasing. Along with the National Parks Conservation Association, SUWA has formally protested the BLM’s leasing decision. While the BLM’s assessment acknowledges drilling could have adverse impacts, it points out that the leases come with stipulations that would limit access across the rail line. Subject to additional environmental analysis, proposed development may leave no surface disturbance within the 200 feet on either side of the rail grade. Late last month, the BLM offered 20 parcels there, but none attracted the minimum $2-an-acre bid, which meant they could be leased for $1.50 an acre over the counter in the agency’s state office in Salt Lake City. A company called FIIK Exploration did just that within days. In October, this company obtained six leases on state trust sections intermixed with the BLM parcels for $2 an acre. Meanwhile, the BLM will offer seven more parcels there at its next lease auction in June. The Golden Spike is back in Utah for a rare reunion of spikes from the transcontinental railroad. But the ‘Lost Spike’ is still lost. FIIK incorporated as a Utah company last August, listing a Millcreek residential address as its headquarters. A man named Sean Bullis, the principal of a turf and lawn-care businesses listing the same address, registered as FIIK’s bidder for the March auction. Efforts to reach Bullis were unsuccessful. If history is any guide, however, Utah’s northwestern corner will not likely see much drilling. Through the years, hydrocarbon prospectors drilled 13 wells in Box Elder County; all but two were dry, according to the assessment. There is no energy development anywhere near the leasing area, which was subject to seismic exploration from the 1950s to the 1990s. A decade ago, when oil prices were spiking, two wildcat wells were proposed on private lands there, but the plans were dropped. The lack of energy potential has observers scratching their heads, wondering why a new company with so little history in oil and gas would be amassing leases in this spot. Nonetheless, critics say, leasing lands that won’t see development obligates the BLM to manage the land for one resource at the expense of others. Some of the leases directly overlap or straddle the Central Pacific Railroad, which the BLM now maintains as the Transcontinental Railroad National Backcountry Byway, stretching 90 miles west from Promontory Summit to Lucin near the Nevada line. This span is “the longest contiguous section of the original transcontinental railroad that remains in existence,” covering 4.7 percent of its 1,912 miles, the assessment says. It had fallen into disuse after the Lucin Cutoff, built in the early 1900s across the Great Salt Lake, bypassed it. The rails were taken up in the 1940s to provide steel for the U.S. war effort at the time. These days, about 25,000 people a year drive the byway, fitted with interpretive signs at 16 spots, to learn about the building of the historic railroad, considered an epic achievement that tied the West to the rest of the country at a time when the North and South were reuniting in the wake of the Civil War. The BLM designated a 400-foot-wide corridor along the route as an “area of environmental concern,” totaling 4,364 acres. Also covered are wooden trestles, stone culverts and “wyes,” or wishbone configurations of track designed to turn around locomotives so they can go in the opposite direction. The route still features 150 examples of these 19th-century railroad structures.